This may very well be the question of the century. With so much access to different mediums, how do you make a concrete decision as an illustrator of whether to create digital or traditional medium illustrations? If you’re lucky, your style can translate to both, but often people who use digital illustration use a lot of flat colours, and those who use traditional like to layer it on. This is all variable however, since there are so many different styles. If you’re following me on Instagram, you likely know I’ve been having this debate with myself for quite some time now, about 3 months to be exact. I keep analyzing my illustrations to see where I can improve, and I started looking into it a little too much. This is probably the most important point. If you know your market, you should be able to know which medium will be better suited to them. For example, if you do a lot of custom portraits and wedding portraits and such, some people might prefer to have something completely unique and original, which would be a painting of some sort. This can also be applied to selling original artwork online, which can be marked up a lot because there’s only one. If you want to do a lot of corporate work like logos, advertisements and product packaging like I do, a digital style is more versatile and allows multiple rounds of editing without ruining the illustration. Do some research to figure out who your target clients are, where you want to see your illustrations and what those clients are currently commissioning. That will give you a good idea of which route might be better for you. 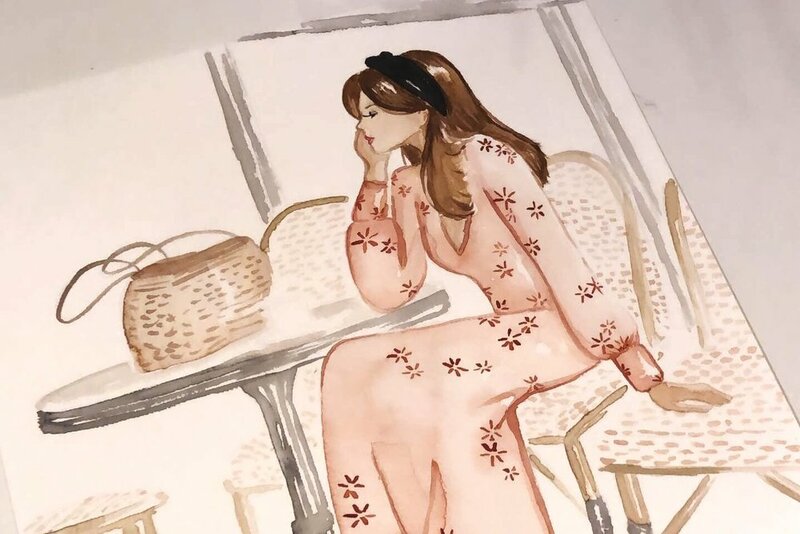 For some, their bold paint strokes and splashes of water are a significant part of their style, and for those illustrators, obviously traditional mediums allow for those happy accidents and more authentic hand made look. If you’re like me, you probably like to refine an illustration and get into the details. Being able to zoom in and shift things around is almost necessary to the outcome of my drawings, so I naturally get a little frustrated with traditional mediums that I can’t “undo”. If you’re not sure what your style is yet, I wrote another post on the topic, but essentially pick and choose what elements you like in illustrations that attract your attention. Start to build upon those and see what draws you in. Things that start to get repeated throughout your drawings are indicators of your style. It’s best to experiment a lot and not rush this process. Are you always travelling and on the go, or like to work from a coffee shop or on the train? Carrying around an iPad is a lot easier than a whole set of watercolours, brushes, water, paper towels, paper and more. 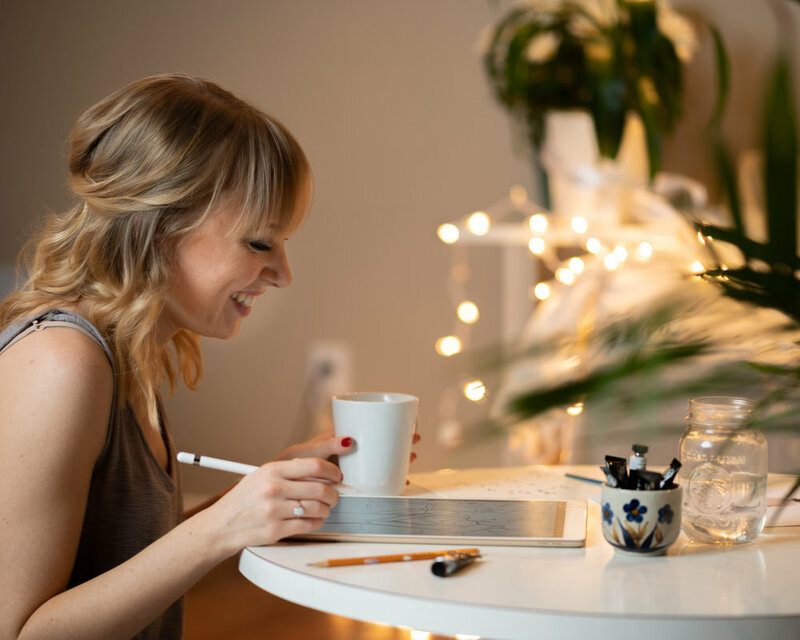 If you prefer to work from home and don’t find yourself out and about too much, traditional mediums are likely a great option for you. Do you like to take your time with an illustration and perfect it, or do you enjoy creating a quick minimalistic style drawing? Think about all the factors, I read somewhere that you should choose the medium that is the easiest, most convenient for you and also for your type of clients. If you’re planning to do this as a career, you’ll likely become very busy at one point or another, and if you’re the kind of person to take on 2-3 projects at a time, you need to make sure you’ll have enough time to complete all the deadlines. That could mean carrying around your iPad so you can sketch in between meetings, or it might mean getting a portable watercolour set. If you’re like me and enjoy painting but prefer the outcome of digital illustrations, you might benefit from having a painting or two on the side that you can work on during your free time. You can even sell these on places like Etsy if you’d like, or just use them as meditative pieces that you do when you have time to. As artists, we tend to think like artists not like business owners. Analyze the costs & benefits of choosing one medium over another, which one saves you more time and effort, and which one gives you the most potential. As artists we dream of fame and recognition, but you need to keep your business running, which means budgeting and being able to afford the supplies you need to make your work. If it’s helpful, you can also analyze it in a 5 year period. Calculate how many drawings/paintings you make in a month, then multiply that by 12 and by 5, then figure out the cost of supplies per painting and do the same thing. Being a freelance illustrator is pretty much the same as running a business, as you may have gathered should you be a freelancer yourself, so it’s time to think like a BOSS. How will you keep your business afloat? Which medium will best support efficiency, high quality work and flexibility? 5. What brings you the most joy? When it all comes down to it, what lights up a spark of excitement in you to finish a drawing or painting? What feels the most natural and beautiful to you? Which result gives you more confidence as an artist? Try out different mediums and see which one resonate with you the most. Whenever I get stuck. I play around with gouache and watercolours for awhile before jumping back to my iPad. It reminds me why I started doing digital illustration and it also gives you a good break. I find whenever I try out a different medium for awhile, I learn new things that I can then apply to my current medium as well. Play a little trial and error game and see what happens. As an artist, this can also drive you crazy though, so don’t put too much pressure around it. You’ll find it overtime and everything leading up to then will be great lessons. After all, if you’re in this type of career field, you’re likely not in it for the money, but you’re in it because it’s something you love to do, so make sure you can keep loving it throughout your career.